Dublin High School is a four-year public high school located in the East Bay city of Dublin, California, United States. It is a part of the Dublin Unified School District. It is a four-time California Distinguished School (1990, 1992, 1996, and 2003) and has won several national academic awards. Dublin High School was established in the fall of 1968 as the second high school in Pleasanton, California's Amador Valley High School District and graduated its first senior class in June 1971. After the incorporation of the City of Dublin in 1982, Dublin High was annexed and combined with the Murray School District to form the Dublin Unified School District in July 1988. Dublin High has been selected a California Distinguished School four times since 1990 (1990, 1992, 1996, and 2003). Dublin High School's Academic Performance Index in 2013 was 877 (the most recent year reported by the California Department of Education) and graduation rate in 2011 was 97.47% (up from 96.16% in 2010). Dublin High School has a California Department of Education statewide rank of 10 (out of 10) and a similar schools rank of 10 (out of 10). In August 2015, Dublin High School was notified of inclusion in Newsweek's 2015 List of America's Top Public High Schools (ranked #165, the top ranked Tri-Valley high school). Dublin High School was also awarded a Silver Medal in the 2015 U.S. News & World Report ranking of high schools (in 2015 7% of schools in the United States achieved Silver Medal recognition). GreatSchools.org ranks Dublin High School as a 10 out of 10. 10 Dublin High School Class of 2011 seniors received National Merit Scholarship Program recognition for their performance on the PSAT/NMSQT in 2010. Two Dublin High School Class of 2013 seniors, Malina Jiang and Nancy Zhou, were awarded National Merit Scholarships in May 2013. Dublin High School was named to the CollegeBoard's Annual AP Honor Roll in 2011 for increasing access to AP courses while maintaining or increasing the percentage of students achieving a 3 or better on AP exams. 73.2% of Dublin voters approved School Bond Measure 'C' in the November 2004 election. The measure approved the Dublin Unified School District to issue $184,000,000 in school bonds over time for various school improvement projects. Dublin High School was the primary beneficiary of Bond Measure 'C', with $120,000,000 dedicated to a complete renewal of the DHS campus (the renewal began in 2008 and was completed in 2015). The renewal includes a new 500-seat Center for Performing Arts and Education, a modernization of the 1968 gymnasium, and a new courtyard. Dublin High School now has a capacity for over 2,500 students. The Dublin Unified School District was recognized by Green Street Scene in 2009 with a Green Building Award for the use of green technology in the renewal of Dublin High School. Dublin High School has a comprehensive music program offering instruction in Marching Band, Concert Band, Jazz Band, Color Guard, Indoor Drumline, Concert Choir, Advanced Choir, Show Choir, String Orchestra, and Advanced Placement Music Theory. The Marching Band competes in the Western Band Association (WBA) and Northern California Band Association (NCBA) in the AAAAA Division and has a membership of 147 students as of 2017. For over 30 years, the Dublin High School Irish Guard music program has offered many opportunities for students to perform, including field show competitons, home football and basketball games, concerts, and community events. The marching, concert, and jazz bands have performed in many diverse locations including Hawaii, Disney World, Canada, Ireland and Carnegie Hall in New York. The Concert Band performed at Symphony Center in Chicago in April 2014. In March 2016, the marching band travelled to Ireland to perform in the annual Saint Patrick's Day parade in Bray, as well as a concert band performance at two schools, Portmarnock Community School and Loreto Secondary School. The director of bands at Dublin High School is currently Elliot Polot. Dublin High School added a pre-engineering Project Lead the Way curriculum in 2010, funded by $80,000 in donations from corporations and foundations, starting with Principles of Engineering. In 2011 the program expanded to include Introduction to Engineering Design. On February 22, 2012, MythBusters stars Adam Savage and Kari Byron participated in a panel session at the Dublin High School Engineering and Design Academy Open House. 1,000 people attended the sold-out event. Ms. Eugene Chou, leader and spearhead of the Engineering Academy, former faculty advisor to the award-winning Gael Force Robotics club, and current advisor of Engineering and Computer Science club, Gael Force Build, won 6th annual Project Lead The Way California Teacher of the Year award on 2 February 2017. ^ "Dublin High". National Center for Education Statistics. Retrieved January 30, 2019. ^ "California Department of Education Distinguished Schools". CDE. ^ "Dublin Unified School District API Results". ^ "Dublin High School Similar Schools Ranking Improves to 10 out of 10". July 13, 2012. ^ "Dublin High School Academic Rankings (API, SAT, AP, ACT, College Admissions)". July 24, 2010. ^ "Dublin High School Named Top Tri-Valley High School by Newsweek (America's Top High Schools 2015)". OneDublin.org. ^ "US News and World Report - Dublin High School Silver Medal". U.S. News & World Report. ^ "GreatSchools.org Dublin High School Profile". GreatSchools.org. ^ "National Merit Scholarship Program Recognizes Dublin High Students". October 27, 2011. Archived from the original on May 26, 2012. ^ "Dublin High School Senior Awards Night Class of 2013". May 23, 2013. ^ "Dublin High School AP Test Results Earn Dublin AP Honor Roll Recognition". November 1, 2011. ^ "Measure 'C' School Bond". SmartVoter.org. December 15, 2004. ^ "Dublin High School Center for Performing Arts and Education Construction Update". OneDublin.org. April 25, 2013. ^ "Dublin High School Renewal Project (or $120M of your tax dollars in action)". OneDublin.org. January 16, 2010. ^ "Green Street Scene Leadership Award Winners". GreenStreetScene.com. 2009. Archived from the original on January 25, 2013. ^ a b "DHS Marching Band, Instrumental Music, Choir and Colorguard". DHS Marching Band, Instrumental Music, Choir and Colorguard. Retrieved April 9, 2019. ^ "Engineering Academy Opens at Dublin High School". Patch.com. 2010. ^ "Dublin High School Engineering Academy Set to Expand in 2011-12". OneDublin.org. 2011. ^ "MythBusters hosts visit Dublin High". ABC 7 / KGO-TV. 2012. ^ "Dublin High school teacher named state teacher of the year". Retrieved February 26, 2017. ^ "PLTW Teacher of the Year From Dublin High School". The Independent. Retrieved February 26, 2017. ^ "Bucs draft OT Alex Cappa out of Humboldt State". SBNATION. ^ "Dublin's Peelle Excited by Opportunity to Play for 49ers". DublinPatch.com. ^ "City of Dublin Mayor Tim Sbranti on Leading California's Second Fastest Growing City". OneDublin.org. ^ "Dublin High School Alumni Eric Swalwell Defeats 40-Year Congressman Pete Stark". OneDublin.org. ^ "Dublin High School Attends Royals Spring Training, Hosted by Yost (photos 3 and 4)". The Kansas City Star. 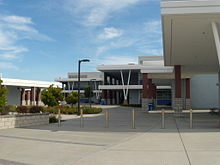 Wikimedia Commons has media related to Dublin High School (Dublin, California).